In November I was fortunate enough to be able to take part in a study tour of Palestine and Israel organised by ICAHD, the Israeli Committee Against House Demolitions. It was particularly focused on discovering what daily life is like for Palestinians today in Israel and the occupied territories known as the West Bank. Jews have suffered centuries of persecution in Europe, culminating horrifically in the Holocaust; it is a terrible history, and the claim for a Jewish homeland is something that I fully accept. However, a previous visit to the Holy Land and much of what I have read, raised serious questions for me about the way Palestinians are being treated by the Jewish State of Israel, (this is how it names itself) and I wanted to know more. The tour introduced us to Palestinians and Israelis, Jews, Moslems and Christians who are seeking a just peace. Some of these were also human rights lawyers, medics, journalists, psychologists, and UN workers. For five days we were based in Bethlehem. It was a poignant place to be so near to Christmas, and for this article I would like to focus mainly on some of our experiences there. cattle market. We watched as hundreds of people, crammed together, and already looking tired, inched their way towards the checkpoint itself where young armed soldiers inspected the permits. An old man was refused. Without a word he turned, his face rigid with unreadable emotion. Outside the barrier, I spoke with Amir, a middle -aged man, part of the diminishing Palestinian Christian population. He makes his living selling glasses of thick Arabic coffee to the waiting men. He told us that his family used to own a little land, enough to keep a few chickens etc but twenty years ago it was taken by the State of Israel. At the time he was a first-year university student. He was arrested for throwing stones during a street protest and was imprisoned. 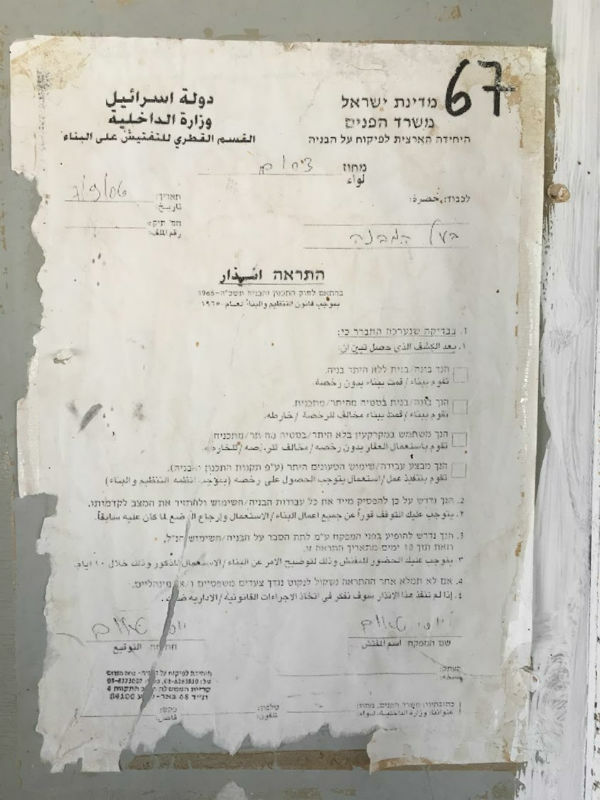 By the time he got out, his university career was over, and because of his prison record he knows he will never be given the permit needed to work in Jerusalem, so he sells his coffee and remembers. more like a poor and densely overcrowded township, with little in the way of shops or infrastructure. The United Nations Relief and Works Agency say 3150 people live within its 0.071 sq. km boundaries. There are five watchtowers overlooking it, and along one side, the Wall. Frequent incursions by the army take place, usually during the night, when boys are taken away and questioned by the military – traumatic and scarring experiences for them and their families. Following the establishment of the State of Israel, around 750,00 Palestinians were driven from their homes. 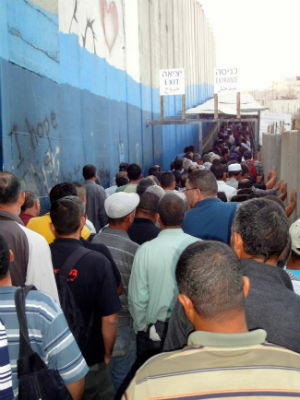 Palestinians call this ‘the Nakba’– ‘the Catastrophe’. The people fled across neighbouring borders or became internally displaced in their own country.In 1950 Aida was provided by the UN for the refugees from 26 villages. 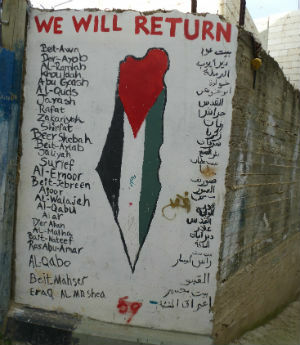 The names of these 26 villages are written up on walls in the camp and people keep the keys to their old homes as a sign of hope and resistance. Meanwhile they do what they can, creating a colourful playground for the children, and a cultural centre, where vegetables are being grown on the roof. owned land, in their case enough to produce thousands of litres of olive oil a year making them a comfortable living. “One morning”, he said, “I went to groom my olive trees and there were soldiers who told me the land no longer belonged to me.” Land seizures are far from being a thing of the past. Many times, we heard accounts of land being taken and houses being demolished or taken over. The United Nations office in the West Bank reports that between 2009-2016, Israeli authorities demolished or seized over 4,800 Palestinian – owned structures in the West Bank and East Jerusalem alone. We travelled to the Neqev, the vast and beautiful wilderness of southern Israel. Once it was dotted with Bedouin villages, but now few remain, as people are steadily forced to move into small urban townships where Bedouin culture and their agricultural way of life cannot exist, although they try hard to maintain it. We saw where a village had been demolished to make way for a forest, another was to be demolished for the road to an Israeli settlement. In the village of Al-Sira, we were given lunch in a house with demolition number 67 posted onto its door. But the people are actively resisting. As it says on the wall of a village community hut, ‘To Exist is to Resist’ – it’s that simple. fences, will be 440 miles long and visible from space. It cuts families off from their olive groves; and creates numerous checkpoints, necessitating permits which must be obtained before travelling to hospitals, or work, or to transport farm produce to market in Jerusalem. 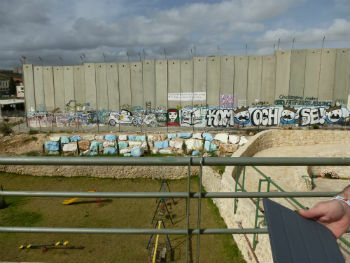 The wall is famously graffitied by Banksy – to a mixed reception from Bethlehemites. The wall certainly does not ‘keep the Palestinians out,’ as tens of thousands of Palestinians live within Israel itself, and thousands more who live in the West Bank work in Israel. Some, like Israeli academic Jeff Halper, argue that its real purpose today is political and demographic; 85% of its convoluted route is built in Palestinian land, and it snakes around illegal Israeli Settlements placing them on the Israeli side of the BarrierWe did not see any overt violence during our stay, but plenty of evidence of demolitions. We saw the tight military control of the West Bank, and heard many accounts of arrests and disproportionate punishments. We saw what Catholic Social Teaching identifies as Structural Injustice – injustice that is deeply embedded in discriminatory laws, regulations, systems, attitudes and values. Thousands of pilgrims go to the Holy land every year, but they are often bussed into the holy sites and out again, unknowingly passing the sites of demolished villages and never really having a chance to meet the people or hear their stories. There are Pilgrimage Tours that include some acknowledgement of the Palestinian experience, and we should look for these. There are also the ICAHD tours and projects that I took part in, and excellent ‘Witness Tours’ run by Christian organisations such as Sabeel- Kairos and The Amos Trust, that combine Pilgrimage with an experience of the social and political realities. These can all be found on-line. The people we spoke to had no easy answers, only a determination for justice and a longing for peace, so that they can just get on with their lives. We were often thanked for coming and asked to tell people what we had seen. Palestinian hospitality is warm and welcoming, they love visitors to come. The food is wonderful, and for tourists it feels very safe. It’s a never to be forgotten experience.